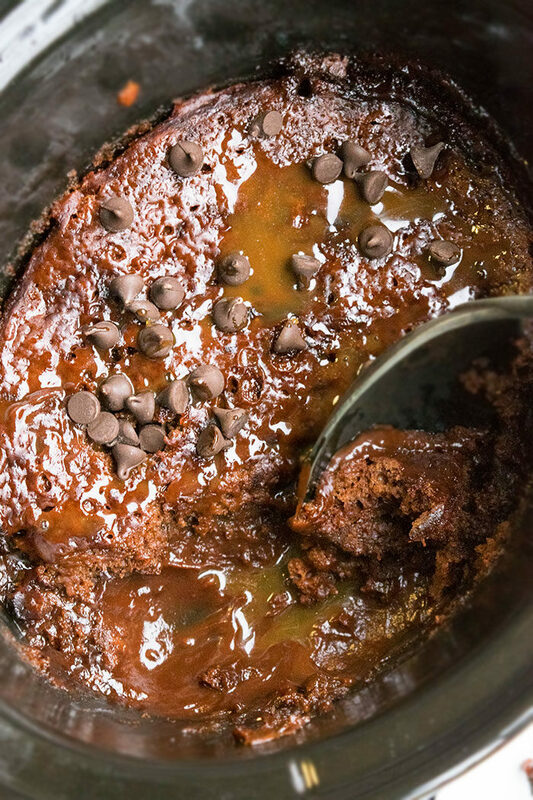 Quick and easy chocolate molten lava cake recipe, made with simple ingredients in crockpot. It’s a lava cake with chocolate filling. Starts with cake mix! This classic, old fashioned chocolate cake is totally different than any other cake recipe I have ever shared here. 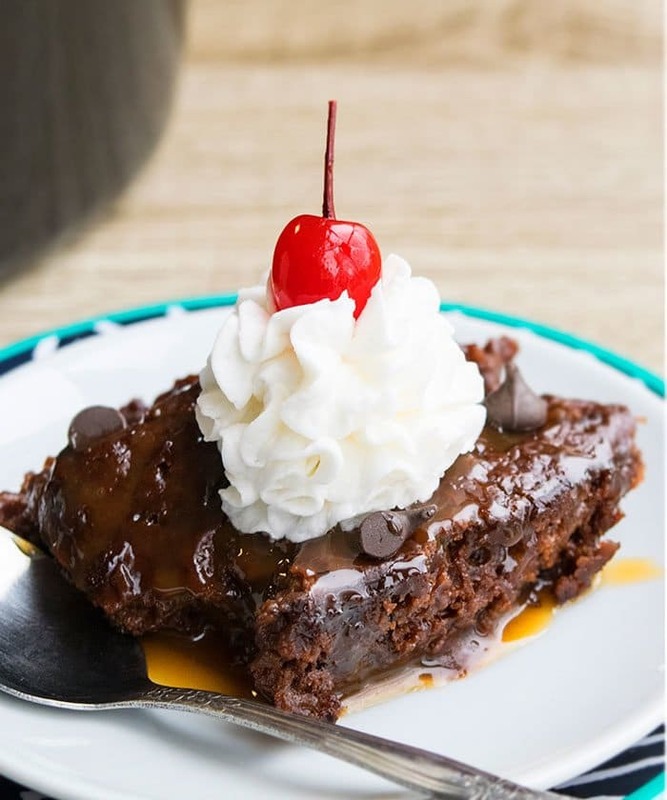 The cake batter cooks in the crockpot instead of the oven in such a way that at the end, there is a soft cake layer on top with a rich, creamy, ooey gooey chocolate filling/ sauce at the bottom. Basically, this cake is a cross between a fudgy brownie, soft chocolate cake and a soufflé. It’s just as delicious as this Chocolate Bundt Cake. Also known as chocolate pudding cake, chocolate lava cake, hot fudge cake, pudding cake, self-saucing cake! 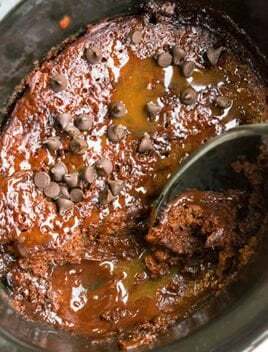 How to make chocolate molten lava cake recipe? Prepare the cake mixture and pour it in a slow cooker. Prepare the pudding mixture and pour it on top of the cake batter. Cover and cook for about 3 hours. Souffle cakes can be sweet or savory and are light and fluffy in texture. Lava cakes, on the other hand, are ooey gooey and have a molten chocolate lava center. What is inside lava cake? It’s a warm, rich and creamy chocolate mixture. Can molten lava cakes be frozen? I don’t recommend it because the center does not remain as creamy and ooey gooey when thawed. IMPORTANT: DO NOT mix the layers!!!!! IMPORTANT: Your cook time may vary, depending on the brand of your slow cooker, size and shape. It’s typically 2.5 hours for me and I use a large, oval 6 quart crockpot. Some of my friends prefer to cook it for a little longer up to 3 hours. Grease crockpot generously with oil to prevent the cake from sticking. For easy clean up, you can line the slow cooker with parchment paper, which also prevents the sides of the cake from burning. Do not over-cook the cake because it will not remain as ooey gooey at the bottom any more and the edges will start burning and drying. Cake is ready when the top sets up like a sponge and an inserted toothpick only halfway through the center comes out clean. Instead of chocolate chips, add your favorite chopped candy bars like Rolos, Reese’s peanut butter cups, Hershey’s Kisses e.t.c. Use a combination of various chocolate chips like semisweet, milk, white, butterscotch, peanut butter e.t.c. Ice cream– Tastes best when served with vanilla ice cream but can also be served with other flavors of ice creams. Topping options– When the cake is ready, drizzle caramel sauce or fudge sauce or melted peanut butter pr melted Nutella and even sprinkles. Kids love sprinkles! Fruit toppings– When the cake is ready, top off with fresh fruits like strawberries, raspberries, blackberries. Instead of ice cream, serve with whipped cream. In a large mixing bowl, add cake mix, milk, oil, eggs and mix until smooth. Pour mixture into a greased/ oiled slow cooker (large oval slow cooker- I used a 6 quart one). In another mixing bowl, mix together pudding mix and milk and gently pour the pudding on top of the cake mixture. DO NOT MIX TOGETHER! Sprinkle chocolate chips on tip and once again, do not stir or mix. Cover and cook on high for 2.5 hours – 3 hours. I love the texture at 2.5 hours but you can cook for longer if you want it to be a bit more firmer. Cake is ready when a toothpick inserted ONLY HALFWAY in the center comes out clean. Drizzle caramel sauce and sprinkle more chocolate chips on top, if you like. Serve warm with vanilla ice cream or whipped cream. Enjoy! 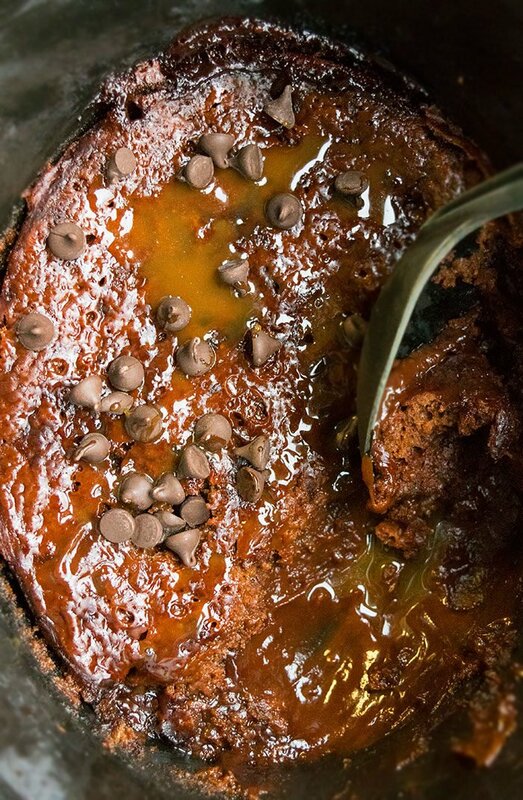 Tastes best and is the most ooey gooey, when served immediately. However, leftovers can be stored in a sealed container in the fridge for up to 3 days and reheated in the microwave for 15-20 seconds.